Japan's NHK television showed collapsed walls, broken windows and water leaks throughout the area. Tens of thousands of people lost power after the quake, but officials said most areas got electricity back by midday. Earthquakes are common in Japan, which is part of the seismically active "Ring of Fire." The area covers the South Pacific through Indonesia and Japan, across to Alaska and down the west coast of North, Central and South America. A 7.3 magnitude earthquake struck near the Japanese city of Kobe in 1995, killing more than 6,000 people. 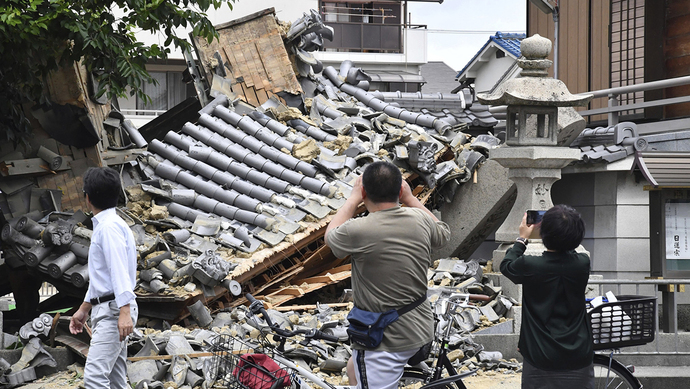 Monday's quake followed a series of smaller ones reported near Tokyo in recent weeks. Parts of northern Japan are still recovering from the 9.0 quake and tsunami in 2011 that killed more than 18,000 people. Our building lost power during the storm. 5.Monday's quake followed a series of smaller ones reported near Tokyo in recent weeks. 6.Officials warned of strong aftershocks throughout the area and urged people to stay away from damaged structures. The doctor told him to stay away from fat food.